Ejji Ramen – eating my way through Charm City! Belvedere Square has renovated and there are a bunch of new faces – one being Ejji Ramen. This is the same family who does Chocolatea and people have been raving about their noodle bowls for as long as I can remember. 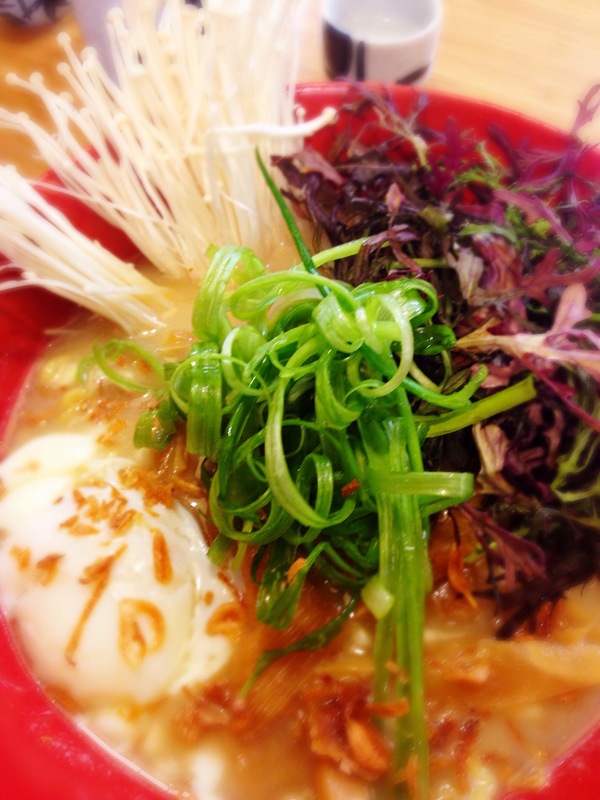 The idea of ramen and noodles draws you over to the counter. Well, that plus the creative lighting and inviting space and staff. There are several tables that belong to Ejji. Have a seat and they offer full service. They also have counter, where you can still have full service, but see the kitchen and watch the masters at work. This is where I sit, because I like to banter with the industry folks. They have added a bar service to the menu with a few local beers, limited wine choices and sake. But, we didn’t come there for the sake – we sat down for the ramen. I personally found the menu slightly overwhelming with choices. There are a lot of choices – step 1 include picking a broth, then step two is your noodles – you can have rice noodles, classic thick wavy ramen noodles, or even noodles made of veggies like squash and carrot. Then you add as many of the 1000 topping choices and a sauce. Whew! I started to want everything, so I let the staff do all the work and picked a ramen bowl already created. The vegetarian Miso Ramen made with the sweet miso corn broth and the thick wavy ramen noodles. All of their bowls are topped with crispy shallots and scallions. But my bowl came with crunchy corn, softened bamboo shoots and a ton of gorgeous enoki mushrooms. They also added my favorite thing – a poached egg. I opted for the pickled shishito sauce for a little extra spice. I added the sauce, broke apart the egg and mixed it all together. This is a huge meal. I could only eat about half. The pork sauce is good, much saltier than the corn miso broth, but goes really well with the chunks of pork belly, ya know, if you are into that sort of thing. I also recommend the veggie noodles. They keep their firmness and give you some added nutrients. I can’t wait to go back. So far, Ejji is one of the more impressive spots in the market – from food to personality. Please go check them out. This entry was posted in Belvedere Square, Charm City, Hooray!!! Winner!, Lunch, North Baltimore. Bookmark the permalink.